I have been on the journey of a self-published author for nearly a decade. In this time of year end reflection it dawns on me that I owe a debt of gratitude to my readers. The collateral goodness of writing is connection with the hearts and minds of kindred spirits. Making a buck is always a good thing, but that is not why writers write. They do it because they want to share experiences in a way that engages and inspires others. The act of writing our thoughts comes back to us in strange and mysterious ways. While I was at a guest ranch a man took a tumble off his horse. He bounced back up smiling and said" I want to thank you little lady. You just saved my life! I read you article the "Art of Falling" and I knew just what to do to break my fall and keep from getting hurt." That meant more to me than I can express here. It has been so wonderful meeting people online who have read one of my books and have found it worthwhile, even rewarding to travel with me, and my characters. Even though my books are in different genres, a common theme is that they are all destination pieces. They all take you to a places you can't get to any other way. It is my extreme pleasure to give back to the world in this way. This a note of thanks to all of you have purchased my books and posted reveiws for them. That means so much to get feedback and to know that people have enjoyed my work. I hope there will be many more readers who want to see the ancient Hawaiian culture through Wai-nani's eyes, or will take a thrilling ride with Gemcie in the Cowgirl Jumped Over the Moon, or become a stow away in the " Lost Angel's "backpack for more wonderful outdoor adventures. I am busy gathering more tales for my second travel collection. You can help me by selecting the title you like best. Please leave a comment letting me know which one you like the best. Wishing you a Bountiful New Year filled with love and laughter!! It's been a wonderful year for me filled with exciting journeys. Here are some of the articles I published that give you details on how to walk in my footsteps if you get a yen for adventure. It's not over yet! 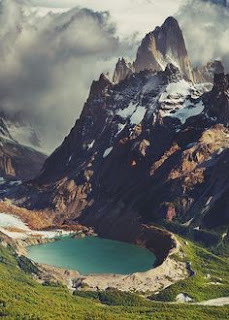 I am leaving for Patagonia in a couple of days and will return with articles about the exotic locales I visit with Overseas Adventure Travel. Highlights of the year include attending the Bird Fest in Morro Bay that takes place in February and kayaking in the estuary. Hiking in the Rocky Mountain National Park just outside of Estes Park. Riding in the Hoofprints of Isabella Bird at Sylvan Ranch The Lady of Rockies first stop when she rode solo here in 1873. 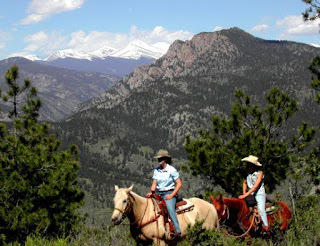 Getting a real horseback riding experience at the Laramie River Ranch located on the border of Colorado and Wyoming. 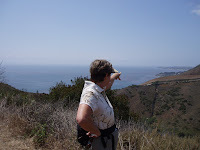 Hiking in the Jack London Beauty Ranch two weeks prior to the dreaful fires that scorched the area. 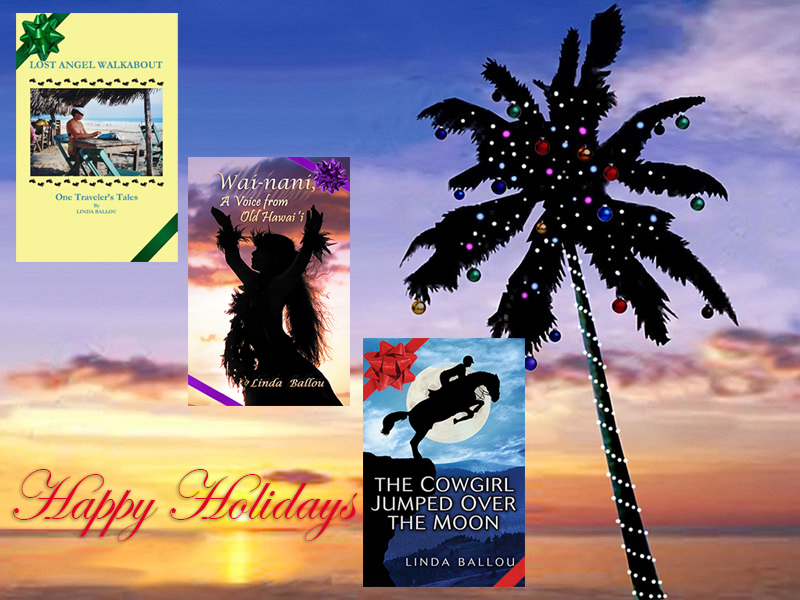 Horse Book Holiday Giveaways from 4 Great Authors. Adventure. Romance. Action. Drama. Inspiration. 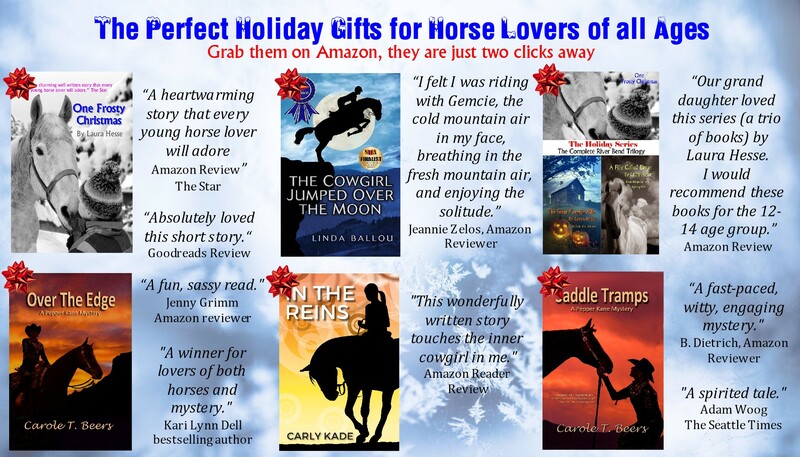 Let these equine adventure stories by Laura Hesse, Linda Ballou, Carly Kade and Carole T. Beers, help keep you warm this holiday season. One Frosty Christmas is a heartwarming, hanky-waving Christmas classics for girls 8 – 14. The River Bend Trilogy includes the inspiring and action-packed Walt Disney type of Young Adult equine novels in The Holiday Series: One Frosty Christmas, The Great Pumpkin Ride, and A Filly Called Easter. Where do I get my FREE copies? 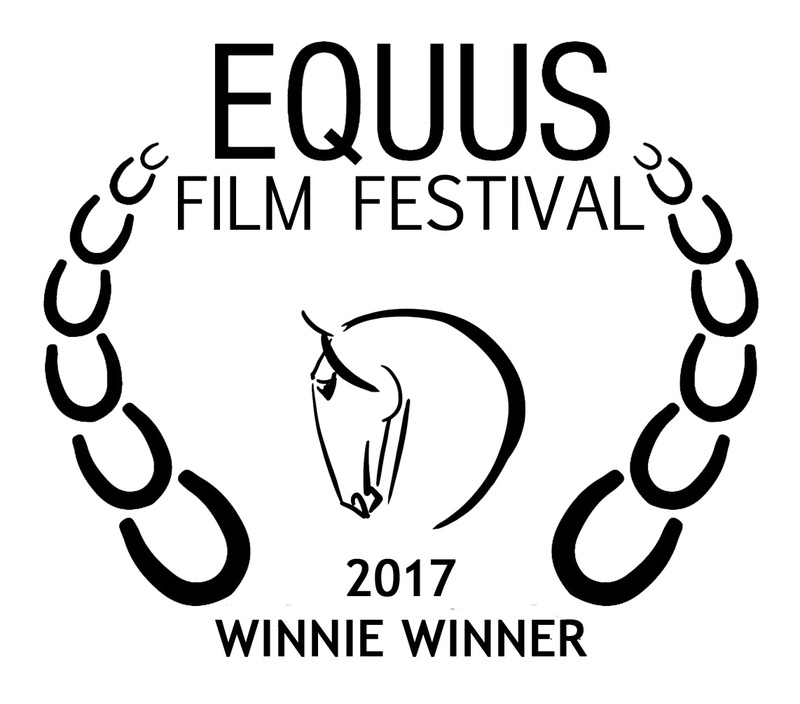 In the Reins is a story of mystery, suspense, romance (enter handsome cowboy), and self-discovery as a woman returns to her horse riding roots. Saddle Tramps: Meet Pepper Kane … a sassy ex-reporter, cowgirl, mother of wayward adult kids and daughter of aged parents, who’s putting her brand on a new career in the romantic, mystery-filled modern American West. Over the Edge (book 2): Danger and desire swirl about modern cowgirl-sleuth Pepper Kane as she uses her ex-reporter skills to solve mysteries she suspects are related. 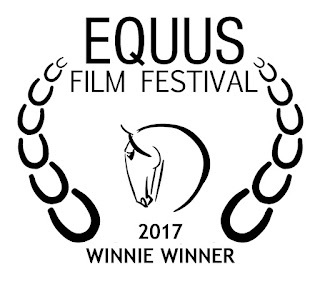 On Thanksgiving eve I was thrilled to learn that Lisa Diersen, the director of the prestigious 2017 Equus Film Festival selected The Cowgirl Jumped Over the Moon for the Founders Choice Winnie Award. To receive recognition running in such good company was beyond my expectations. The response to the book has been extremely gratifying. I wrote the first draft twenty years ago. It was part of the healing process that ensued after an injury that forced me to give up the riding world that I loved. In 2015 I polished and expanded the story for publication.It’s been a tumultuous journey with a very happy ending. 2017 was a wild ride for the Cowgirl Jumped Over the Moon. The first half of the year was dedicated to producing a quality audio book. Narrator, Scott Glennon, delivered an energetic, authentic rendering of my story that is receiving ALL-STAR REVIEWS on audible. I had the pleasure of meeting Scott in Denver after my horseback riding adventure at the Laramie River Ranch. He is a part cowboy, part actor and 100% fine human being. I feel so lucky to have him giving voice to my characters. 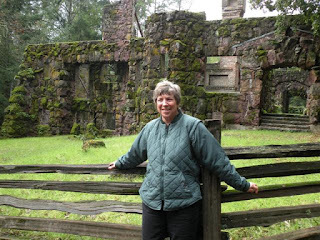 I am an adventure travel writer with a host of travel articles on my site, along with information about my travel memoir, Lost Angel Walkabout-One Traveler’s Tales, my historical novel Wai-nani, A Voice from Old Hawai’i, as well as my latest novel The Cowgirl Jumped over the Moon at-www.LindaBallouAuthor.com. Trail mates come in all shapes, sizes, and attitudes. Get outside of your career coop and hike with someone that gives you fresh points of view. Learn while you burn unwanted calories on this easily accessed 2.5 mile loop. The Sara Wan trailhead located on Pacific Coast Highway at the foot of Corral Canyon is one of the Santa Monica Conservancy’s newer acquisitions. The well-maintained path is wide enough for two and switches back and forth to heavenly vistas. Bear to the left on your way up canyon and enjoy the murmur of Corral Creek as you begin your hike. Fog chased by a cool breeze off the Pacific drifts through stands of eucalyptus, alder, Coastal Live Oak and willow tracing the path of the creek and keeping things comfortable. Soon you will be in mountains frosted with pink bush mallow and lavender Chia sage, so bring a hat, water, and sun block. 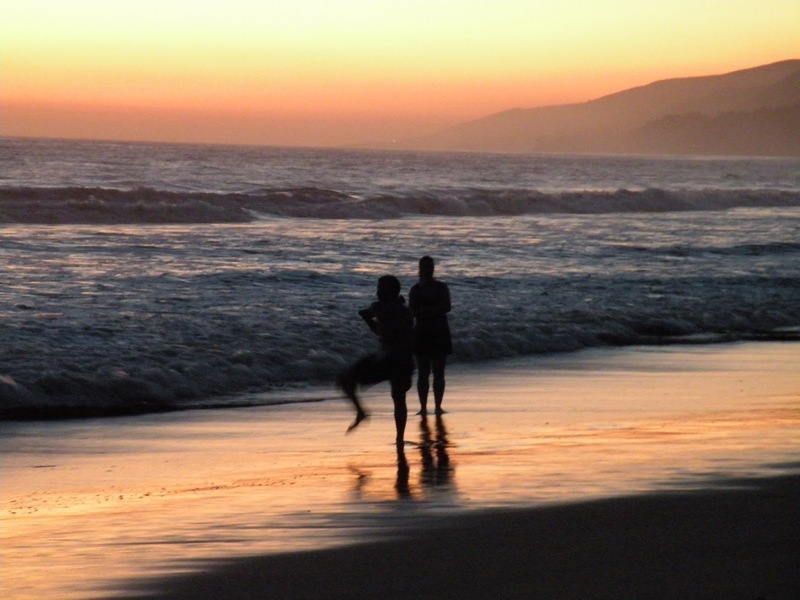 Once aloft, you enjoy an easy stroll with sweeping views of the coast all the way to Point Dume. 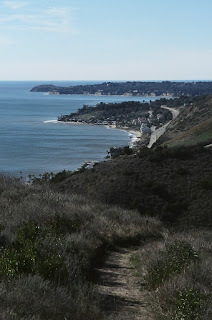 It is hoped that one day the path will connect to trails across adjacent coastal bluffs, but for now it takes you to a vantage point with stunning views of Catalina and the Santa Monica Bay before leading you back to the parking lot. 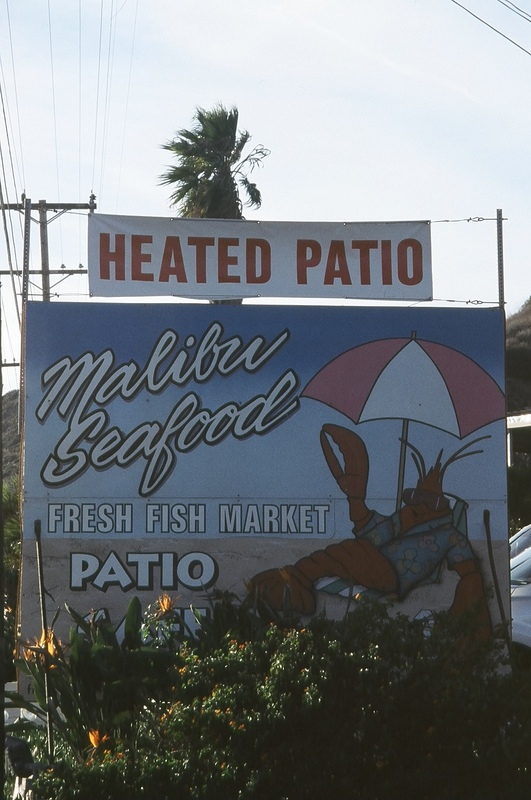 The best ahi burger on the entire 27-mile stretch of scenic Malibu Coastline awaits your return at the open air Malibu Seafood Café adjacent to the parking lot. You can treat yourself to lobster live from the tank, or be happy with scrumptious fish and chips. From the upstairs covered patio, dolphins are often seen cavorting in the deep channel. A flock of wild parrots, migrants from Mexico, have made homes in the palms swaying overhead. A siesta on the Dan Blocker beach on the other side of PCH is a wonderful way to cap off this outdoor day. Bring your swimsuit, umbrella, and a good book and wait for sunset. You can park in the Santa Monica Conservancy lot all day for seven bucks—such a deal! Your friend will thank you for bringing them here. Directions: Malibu SeafoodMarket 25653 Pacific Coast Highway is about 11/2 miles up the coast from Pepperdine University between Malibu Canyon and Kanaan Road. An MTA bus stop is there for those who prefer not to drive. 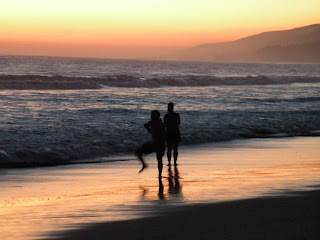 Subcribe to my blog and receive more Outdoor Days ! There's heartbreak, deceit, courage, loss and redemption. And yes, there's romance. From the glamorous world of California Eventing to the freedom of riding the trails in the mountains, the descriptions make you feel you were there. Horses. Romance. Adventure - who could need anything more from a book? 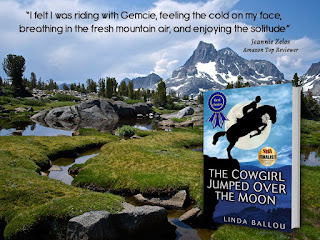 Her writing is so descriptive that you feel you are in the saddle and experiencing everything Gemcie does. 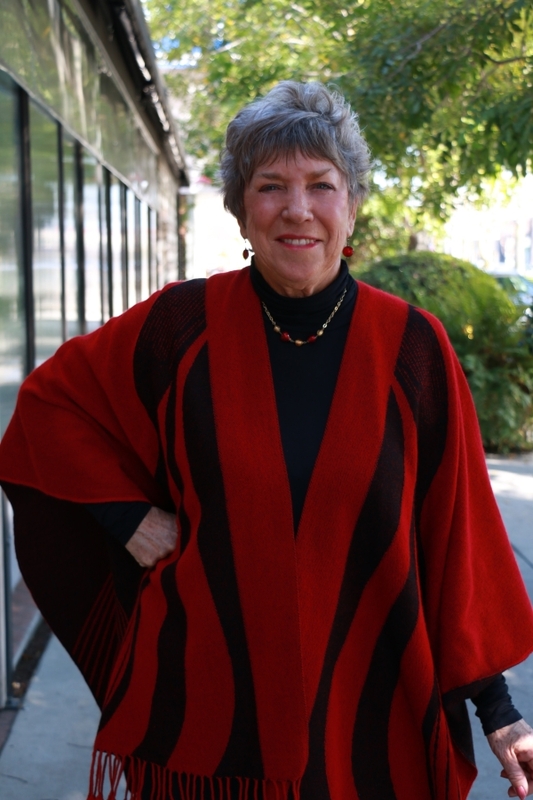 Linda's story of betrayal and loss was beautifully set in the California horse community. Her characters path to healing and redemption will cheer you! 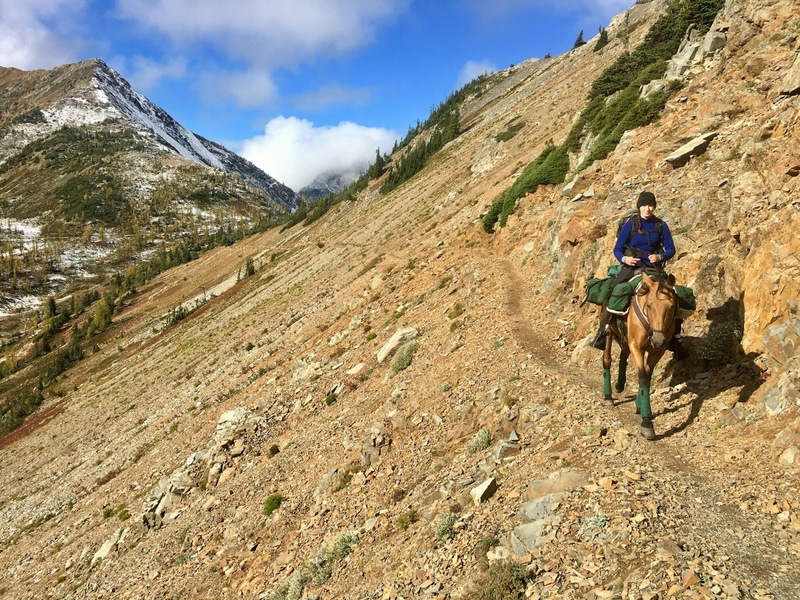 Topanga’s own, Gillian Larson, is the youngest woman to ride the entire Pacific Crest Trail form the border of Mexico to Canada. 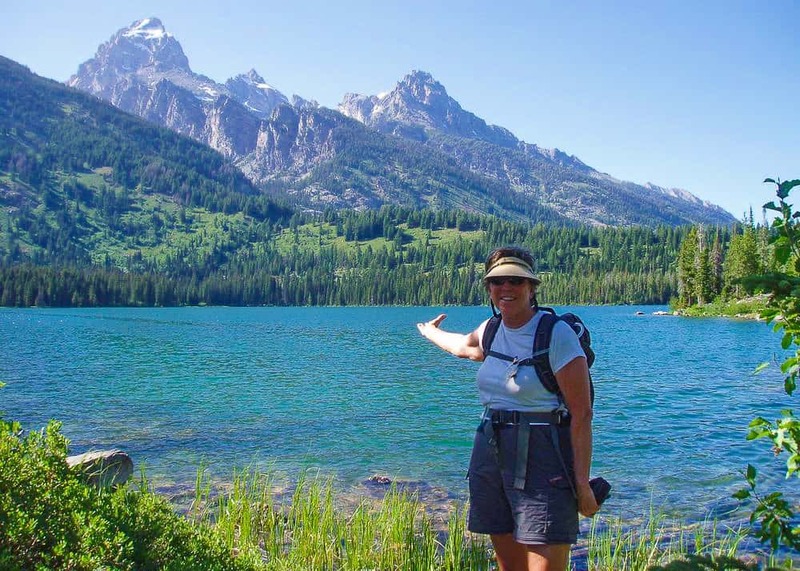 Not just once, but twice, she met the challenge on the 2,660 mile journey that include snowdrifts, downed trees, trails eroded from avalanches, bone-chilling temperatures, adjusting to altitude, landslides and rattle snakes. But, the greatest concern for Gillian was providing enough nourishing feed and water for her two horses. All of these challenges were met with a pragmatic and well-thought out approach that she shared in her talk at Malibu Creek State park hosted by ETI Corral 36. Although 1500 hikers yearly attempt the entire PCT, only a handful of riders have succeeded. The logistics for equestrians are complicated. Gillian bought a pack saddle and learned how to pack, weigh and tie the panniers to her pack horse. She studied maps and downloaded GPS guides. But, the real learning curve took place on her first attempt in 2014 when she was just 22. In 2016 she applied her hard-won knowledge of the trail and made notes about the best grazing and watering stops she hopes to share in a guidebook for equestrian. The first 700 mile of the trip from Mexico to Kennedy Meadows on a narrow track tracing a ridge overlooking Anza Borrego desert is dry, so water is the main concern. In the High Sierra’s where the John Muir Trail, and the Pacific Crest are the same, for 211 miles snow drifts were a major challenge. I was especially interested in how she handled this part of her trek as I took a horse pack trip into “The Range of Light” that inspired sections of my novel The Cowgirl Jumped Over the Moon. I suffered from altitude sickness and temps that dropped into the 20’s at night in this celestial region where spires poke 13,500 feet into azure skies. 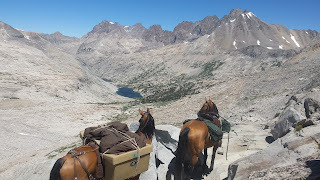 Gillian said altitude had little impact on her, or her horses as it is a gradual climb from the floor of Owen’s Valley and she gave her horse’s day lay-overs along the way. When she entered Oregon over the Bridge of Gods she ran into fickle weather and more snow pack. Washington proved to be magnificently beautiful, but brutal with many log jumbles blocking her way. 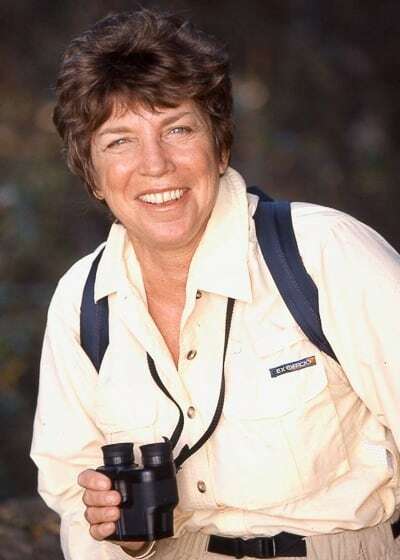 Still, she pressed on making friends with hikers, and other generous folks along the way. I admire this young woman for having done something that I only dreamed of doing. I tried to capture the celestial beauty of the rugged spires in my writing, but Gillian is the real deal. Is it wrong to fall in love with your narrator? I chose a man to narrate TheCowgirl Jumped Over the Moon because I thought women would warm to a male voice. Women and horses are a love story so I figured most of my readers would be female. I was thrilled to get an audition from a man who said he loved the story and that he misted over a couple of times while reading the book. Scott Glennon lives in Colorado so he has a little cowboy in him, and he is an emotional guy! Perfect! I was in Colorado in June to do a little riding at the Laramie River Ranch and took the opportunity have dinner with Scott, and his lovely wife. 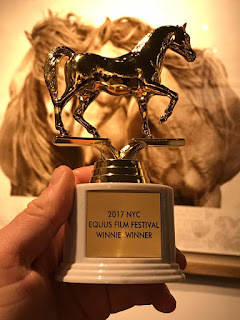 It was such a treat to meet him face to face after connecting with him so deeply in the process of creating the audio book for The Cowgirl Jumped Over the Moon. Hearing my words come back to me enriched by his inflections and emotional interpretations is really exciting for me. He has given each character vocal nuances that are terrific. I find myself getting teary eyed as I listen to my words and come away feeling that we have both done a good job with the story. not make Brady sound like a cry baby. Great writing! The Cowgirl JumpedOver the Moon will be available on Audible.com. Presently available on Amazon in print and kindle format. 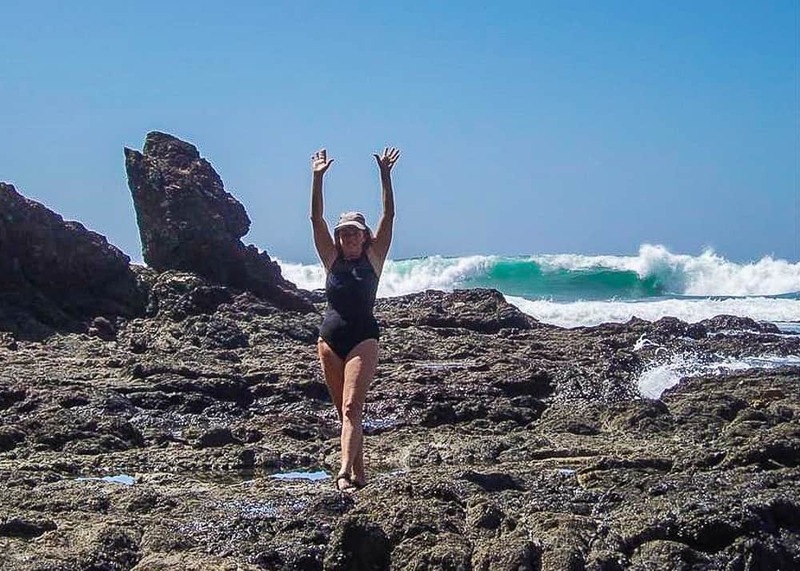 Adventure-travel writer Linda Ballou’s ultimate destination piece, Wai-nani, a New Voice from old Hawai’i, takes you to the wild heart of Old Hawai’i. Her travel memoir Lost Angel Walkabout-One Traveler’s Tales is an armchair traveler’s delight filled with adventure to whet your wander lust. 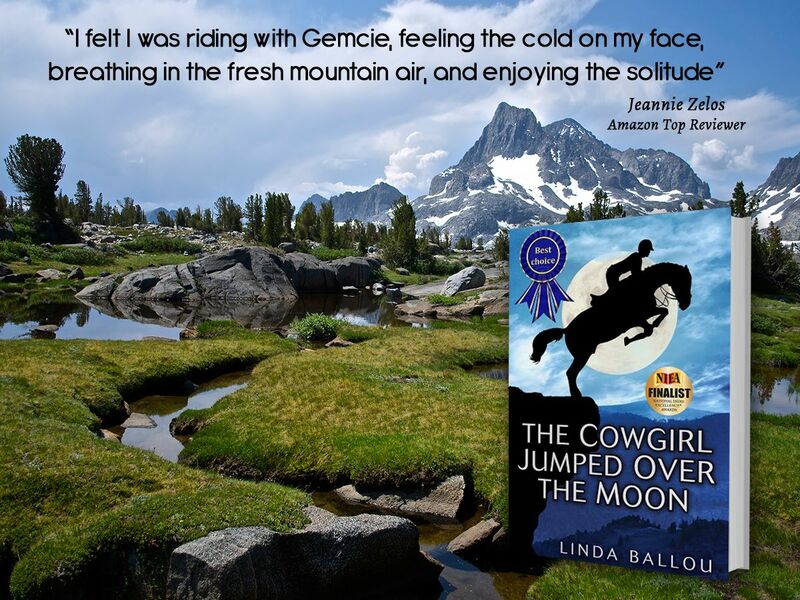 Her latest release The Cowgirl Jumped Over the Moon shares the thrill of the show jumping arena and the tender beauty of the John Muir Wilderness. 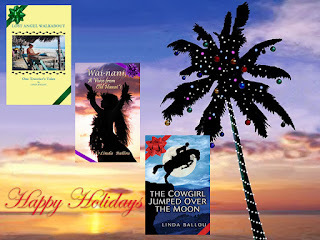 All of her books are available at www.LindaBallouAuthor.com and on Amazon in print and kindle format. 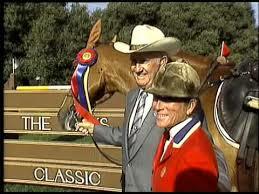 Susan Hutchison, a petite, powerhouse, was recently inducted in the Hunter Jumper Hall of Fame. Her show jumping career has been highlighted by more than three dozen Grand Prix wins. 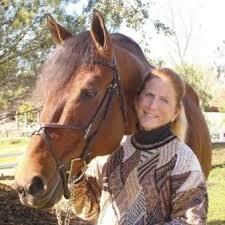 She represented the United States at six World Cup Finals and the World Equestrian Games in Holland. I interviewed her legendary mentor, Jimmy Williams, in 1993.
fistful of students she trains in between competing in International events. Her life has been like an arrow shot from a bow destined to hit the bull's eye. Groomed to become a riding champion from the age of 5, she has had no desire to become anything else in this lifetime. She is totally focused on the riding world, loves what she does, and aims to win. She often competes against her own students, decades her junior. She says horse jumping is one sport that you can actually get better at with age. She has had the litany of broken bones that come with the territory, but has no intention to slow down. Her motto given to her by Jimmy “No Guts, No Glory” is tattooed on her arm. My hat is off to Susan Hutchison. More to come about her incredible career and unshakable spirit in future articles. 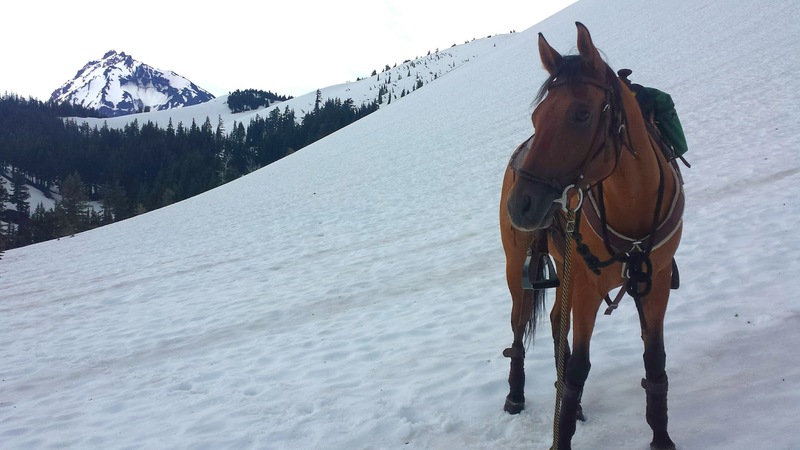 Krista Burleigh, leading my ride, dreamed of owning a ranch and spending her life sharing her love of the outdoors and horses with her guests. She and husband Bill, roamed the West to find the perfect spot. 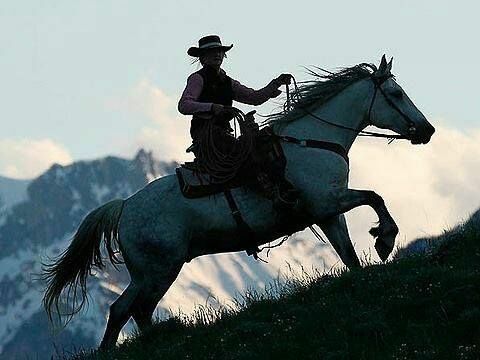 They picked the Laramie River Ranch for its isolation and endless miles of trails that fan from the ranch and offer a variety of terrain and great footing for the horses. I have sampled many dude ranches and the LLRoffers an unrivaled, rustic, authentic western experience on the back of well-trained, fit horses. From a distance the sage-covered hills look barren, but on closer inspection you find they are peppered with a profusion of wildflowers; giant white angelica, lavender lupine, pink vetch, yellow cinquefoil, and orange Indian paintbrush brighten the scene. This is a land of extreme beauty and extreme moods to match. Our ride started out with a blustery wind that kept the bugs at bay. Then an intense sun shone through a mountain of mushrooming clouds forcing us to shed layers of clothing. When we returned to the barn, a cloudburst sent us running to the shelter of the lodge. All of the guests congregate for happy hour at the end of a riding day. Jalapeno poppers and Buffalo wings were my favorite appetizers. Dinner begins with fresh greens, followed by a healthy entre choice, and ending with divine desserts. The day’s activities are shared in the dining hall. Non-riders may hike with a naturalist, do a little fly fishing in the Laramie River, go birding, or just read a good book. A spate in the hot tub under velvet heavens scattered with stars soothes muscles that have not seen action for a while. Lulled by the gentle voice of the river, sleep comes easy. Waking to the sounds of bird twitter and the clatter of hooves as the wranglers bring the horses in from pasture made me eager for another day in the thumping heart of the Old West. There is no internet service at the ranch and nary a flat screen to jog you back into the troubles of the modern world. One man who had come here when he was five was returning 60 years later to share the ranch experience with his daughter. He was delighted to find nothing had changed in the valley. It was just as he had remembered and it thrilled him to be able to give his daughter who had never ridden before more than video games. The wranglers said she was a natural who “stuck to a horse like a spider monkey sniffing glue.” Tears welled as the family bid their farewells to Krista and Bill promising to return next year. As we sat overlooking the verdant pasture nestling the ranch beside the Laramie River in the middle of the pine-framed, untouched rolling hills, I asked Krista if she still loved her life. 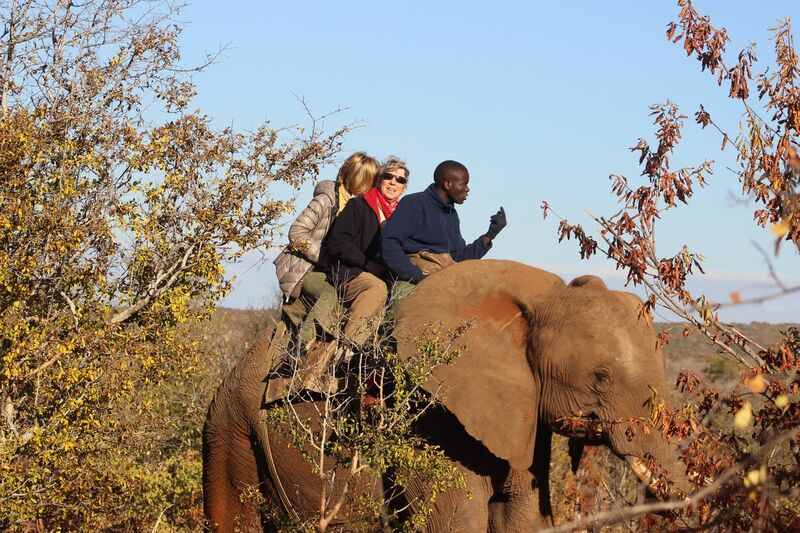 Rides range from 2 hour wild flower walks to all-day rides with a private guide. 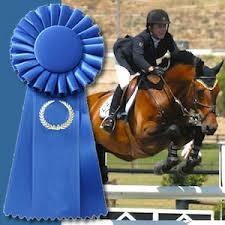 Clinics are available for novices and those who want to perfect their riding skills. Activities for non-riders include fly-fishing, naturalist guided walks, tubing on the Laramie River, square dancing and sitting on the porch enjoying a good book. Laramie River Ranch is less than an hour’s drive from Laramie, Wyoming and 3 hours north of Denver. I took the scenic route through the Poudre River Valley on Hwy 14. It is worth the extra effort, but that last 25 miles are on unpaved county road 103. Be prepared for moose crossings. All photos in this post are courtesy of Diane Lather Belfour and the Laramie River Ranch. 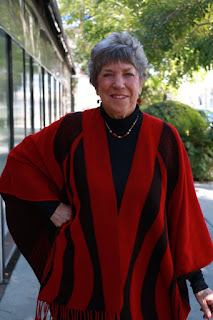 Anda Galffy of Travel Notes and Beyond fame wanted to talk? Here is the interview.. I was born in California, but my parents moved to the wilds of Alaska when I was 13. The beauty of the Chilkat River Valley surrounded by majestic snow-slashed peaks grounded me in nature. I find solace and sustenance in the great outdoors. Today, I am an adventure travel writer based in L.A. My mission is to get to as many naturally beautiful places I can before they are gone. The universal threats to the environment make this journey more pressing with each passing day. 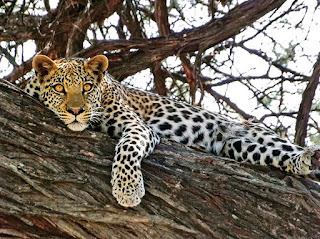 I share my outdoor adventures in travel articles and gorgeous images but, I also have a three books to my credit. Wai-nani: A Voice from Old Hawai’i set in pre-contact Hawai’i; The Cowgirl Jumped Over the Moon that takes the reader from the Grand Prix circuit to the John Muir Wilderness on horseback; and Lost Angel Walkabout-One Traveler’s Tales. My blog is a mixed bag with posts relating to my books and to my travels that serves as a platform for my personal point of view. 3. Do you travel for work or for pleasure? I am in it for all the fun I can get. My handbook “How to Make Travel Writing Work for You” on kindle details the renegade way to get great trips. I am not in it for the money, I am in it for adventures that give me something great to write about. 4. What is the most stunning place that you have ever visited? The south island of New Zealand is the most phantasmagorical as it is so varied. Around each turn on the highway that circles the island is another natural wonder. However, Alaska remains unrivaled in its majesty. I am going to Patagonia in December which promises to be a close runner up. 5. Do you feel that blogging takes time away from your social or family life? Not at all. As I said it offers the freedom to say what’s on my mind. I share my thoughts and experiences on social media which broadens my interaction with other humans. Recently, I have been having fun using my blog as a platform to get article assignments. It has been working like a charm saving me time creating query letters. 7. Are there any countries that you would not consider visiting and why? I am not interested in going to Iraq or other war torn and dangerous places to visit. I love Africa, but there are parts of that continent that are just too risky. I am into to filling my mind with beauty, not angst and turmoil. I give to organizations that are helping with starvation and suffering around the globe to ease my guilt. 8. Do you have any funny travel stories? Look Ways on Both Islands which was published in I Should Have Stayed Home and is in Lost Angel Walkabout details the time I was nearly deported from Tahiti. Being mistaken for a drug mule and grilled by gendarmes for a couple of hours is funny in retrospect, but not when it happened. Jumping a cross-country course in the wild west of Ireland on an Irish Hunter was the most exciting and arguably stupid thing I have ever done. It is a minor miracle that I lived to tell the story titled Irish Mist which is in my book Lost Angel Walkabout. 10. What is your favorite mean of transportation (plane, train, car, ship)? I am a horse person. Riding on the back of a good horse in gorgeous country is my favorite mode of transport. Short of that, I love rafting and kayaking on rivers. 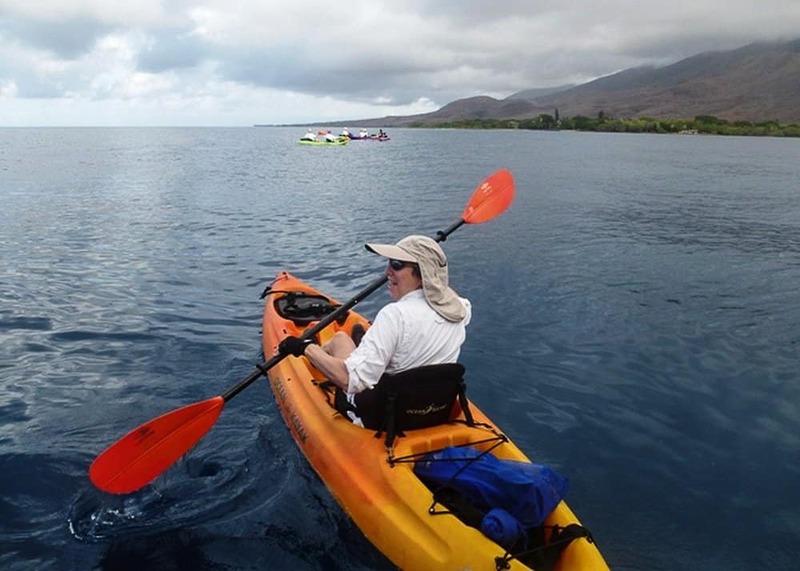 I also loved doing an Un-cruise” throughout the Hawaiian Islands on a small ship with about 25 passengers. From the above mentioned list, I think a road trip in a car provides the most freedom to explore. I made it to Africa and it was all that I had hoped for and more!! 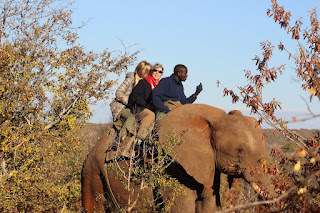 The finale of the trip was a stop at spectacular VictoriaFalls where I embarked on an Elephant Back Safari spotlighted here in FabSeniorTravel newsletter. details onn what I experienced in each country. 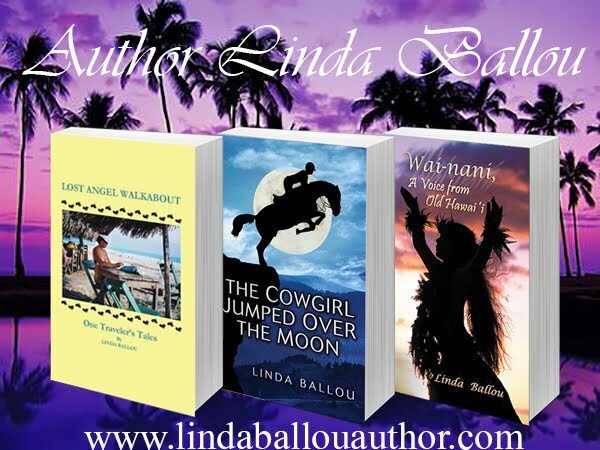 I have a host of travel articles on my site, along with information about my travel memoir, Lost Angel Walkabout-One Traveler’s Tales, and my historical novel Wai-nani, A Voice from Old Hawai’I, as well as my latest novel The Cowgirl Jumped over the Moon at-www.LindaBallouAuthor.com.